It's no secret, I love to decorate for every season, holiday and/or event and I wanted to share my latest homemade "make" with you. My latest sewing adventure was to make some new cushion covers for our benches out in the front yard. I had a vision in my head of candy corn and "sew" I went to work to create my vision. And this is what I came up with: an assortment of Halloween Candy Corn Cushion covers and pillows. But on top of loving to decorate, I also love to save money. 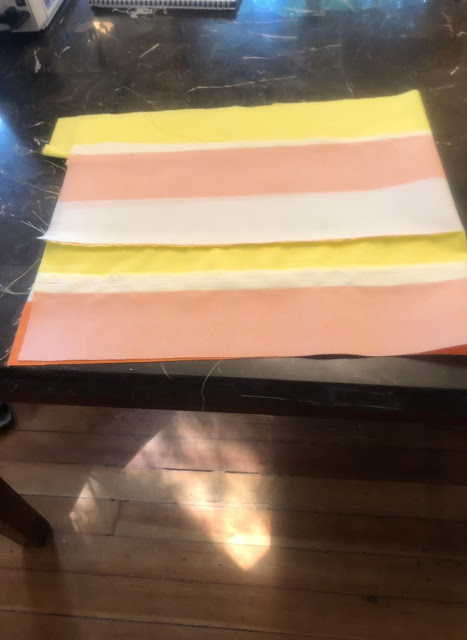 So I went to Joann Fabric and Craft Store during the Labor Day Sale and bought some orange and white striped fabric and some yellow fabric. I simply had to piece the fabrics together to make my little candy corn pillow. I sewed the fabric with the right sides together (which just means the sides you want showing have to be laid face-to-face). Then to make this square into a pillow, I cut it into a triangle and sewed it up the sides. I stuffed the triangle with fluffy batting material and then hand-stitched the edge of one corner. After I had the pillow put together, I went to work on the cushion covers. I needed to fit the material right to the foam cushions because I didn't have a pattern. It was easy to do. All I did was simply drape the fabric over the cushion to get the proper measurements for cutting the fabric. I left an extra inch around the edges (as my seam allowance). You really only need a quarter inch for a seam allowance, but I always prefer to have a little extra (just in case). I used my pressure foot on my sewing machine as the guide to keep the lines straight as I sewed. And it was really easy. 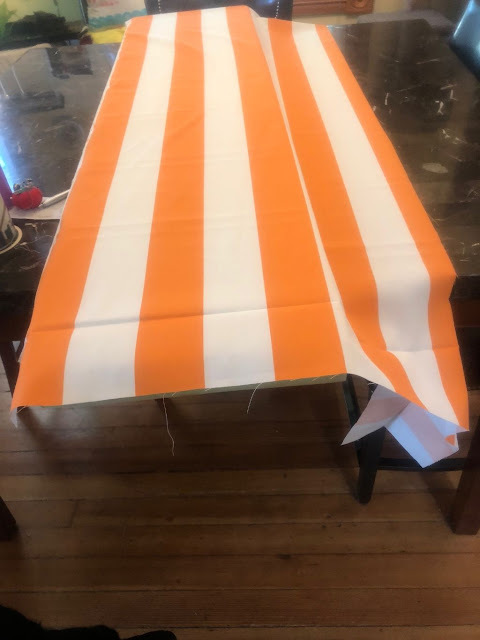 I also wanted to be able to use the cushion covers for more than one month so on the backside I used a solid orange color, which I think is more versatile. That way, I can simply switch out the pillows and use this solid orange colored side all the way through the Thanksgiving holiday. All I have to do is have an assortment of pillowcases for every season and/or holiday...So, I'd better get back to my sewing! Anyway, my decorating has only just begun ;D But I wanted to wish you all a Happy Fall! And if you are making any homemade decorations for the upcoming holidays, please let me know about them so I can visit your blog and/or website. I love to get inspiration from other crafty people. That looks wonderful. Very festive! Thanks Des. I love to decorate. It’s only just begun David ;) Thanks. The candy corn pillows are pretty flippin' cool. Hubby made me Halloween blank books with candy corn pages inside, to write on. I love this season! Cheers and boogie boogie.